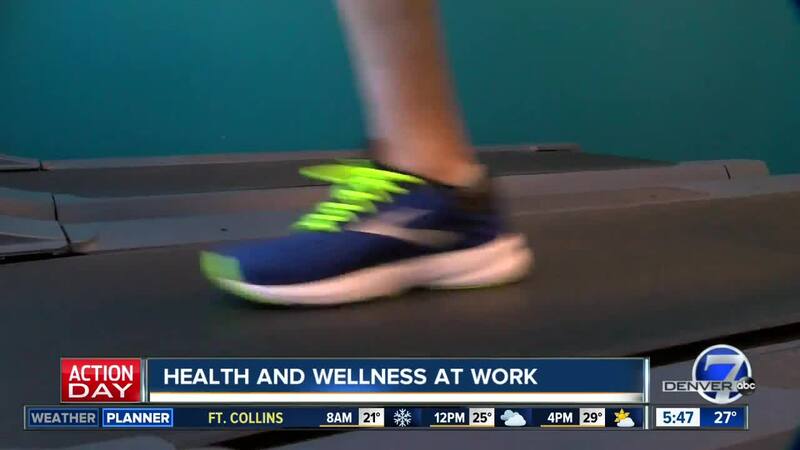 Workplace wellness programs are encouraging healthier behaviors in the office. The office can be a scary place if you're trying to be healthy. A lot of us spend the day sitting at desk, with occasional breaks to hit the vending machines. When you add in the stress, lost sleep and constant digital connection, it can be hard to maintain both your physical and mental well-being. But more companies are trying to change that. Wellness programs are a way for companies to promote and incentivize health. At Fransen Pittman General Contractors, employees have committed to their own and one another's well being. "I was concerned about coming to a desk job that I might put on some weight," said Evan Uttech, who works in the company's Englewood office. But after a year in the company's wellness program, she had lost 12 pounds and improved her biometrics scores. Fransen Pittman Safety Director Tim Taylor saw a similar impact. "For me personally it’s helped my weight — helped me drop a couple pants sizes," he said. The staff at Fransen Pittman have gotten involved in several physical challenges through their wellness program. Some are organized events like cycling races or 5K races, while other challenges involve tracking steps or sleep. The competition aspect helps motivate them. "Last year, when we were doing the step challenge, I was working at the state capitol and I'd always take the elevator up because I was being lazy," said Field Foreman Troy Anderson. "Once we got the step challenge I was like, 'Nope I'm taking those stairs.'" In Colorado, companies can assess their health and safety programs easily through the Colorado School of Public Health’s health links program. It offers low-cost options for organizations to assess their programs, work with an advisor, and become recognized as healthy workplaces. More companies are realizing that these programs can benefit their bottom line. "We know that for every dollar spent on wellness programs there’s about $2 savings in other things, like healthcare costs and increases in productivity," said Ellen Sarvay with workers' compensation company Pinnacol Assurance. Their clients have introduced mental wellness as well, encouraging employees to take breaks from technology, and practice mindfulness. This also helps reduce on the job injuries, saving companies money in workers' compensation costs. In the Fransen Pittman office, the focus on wellness has encouraged the staff to reevaluate their work environment. Their break room has been purged of holiday treats, and the fridge is stocked with sparking water instead of soda. They've also added standing desks, and there's an office gym for those who want to get a workout in during the work day. "When you’re working somewhere that has this in place, it’s amazing," said Evan Uttech. "The energy levels are higher, people want you to care about your health, and I think that’s huge that the owners put that in place."